The first of the training series for the Exchange of Information on Request (EOIR) second round of reviews took place in in Singapore on 4- 8 April. 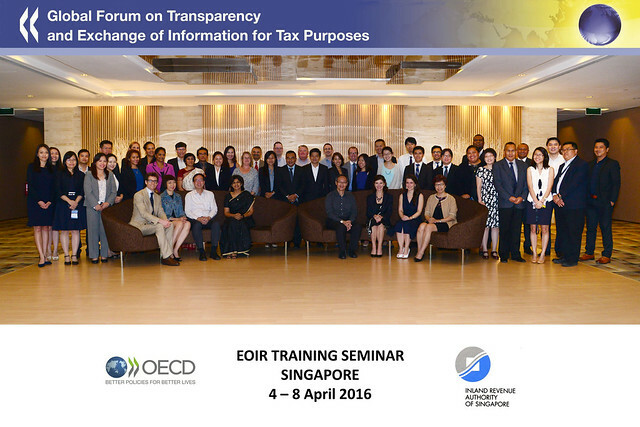 The training was a great success with 50 tax officials from 16 jurisdictions, mainly in Asia, in attendance. The event was organised by the Global Forum Secretariat and hosted by the Inland Revenue Authority of Singapore (IRAS). The training took the form of a 5-day seminar with a “360 degree” format designed to prepare both assessed jurisdictions and assessors for the second round of EOIR peer reviews which will commence in the second half of this year. The seminar included guidance on how to best prepare for the review, what the review will entail and the impact of the changes to the Global Forum’s Terms of Reference, Methodology and Assessment Criteria note and was very practical in nature including a mock onsite visit and PRG meeting for participants. The event was also an excellent opportunity for participants to meet with tax officials from other jurisdictions, to share best practices and to become acquainted with the latest developments in exchange of information. The next of the EOIR training series shall take place in London from May 9-13 with a subsequent francophone EOIR training in Paris 5-9 September.